The final week in Rome was truly full of many blessings and adventures causing the decision and ranking of the top 5 highlights more difficult than I had imagined. 1. Pallium Mass – I have to rank participating in Mass on the Solemnity of Sts. Peter and Paul with the Pope as the biggest highlight of the week. The Pope held Mass in St Peter’s Square while installing 30 new Archbishops and giving them their pallium which is an additional accessory that only Archbishops of Metropolitans receive to wear in addition to their normal vestments as a bishop. After the Mass was celebrated, Pope Francis came down and rode around in the Pope Mobile while giving blessings and waving to those remaining in the square. This marked the second time in 2 weeks that we on The Rome Experience were able to be within 10-15 feet of the Successor of Peter and receive his blessing! 2. 7 Churches Tour – 23 of us started the tour at 8 am at St. Peter’s Basilica before heading to St. Mary Major, St. Lawrence, Santa Croce, St. John Lateran, San Sebastiano, and finishing at St Paul’s Outside the Walls. 11 of us walked to all 7 Churches which was a nice feat until Father Eric said it only counts if we walk back to where we started which was another 3+ Miles. Father Eric, Father Mark, James Beran, Edward Seeley, Ramon Reyes, and myself accomplished the pilgrimage with many prayers for benefactors, family, friends and especially the Pope and his intentions! All told, 6 of us finished a day of prayer and fellowship at 6pm coming in at 19.5 miles for the round trip which included all 4 Major Basilicas. 3. Vatican Train Tour – Saturday was a free day for all the seminarians, so many stayed in Assisi for the weekend as we all traveled there on Friday. Christian and I decided to use the money that would be spent on housing for the night and buy Vatican Train Tour tickets. It was a full day that started with a 2 hour tour of the Sistine Chapel and the Vatican Museum. With the early entrance we went directly to the Sistine Chapel and beat the crowds as we were able to enjoy 45 minutes of admiring the beauty and contemplating the paintings of Michelangelo especially his “Last Judgement” painted wall. Next, we had a tour of the Vatican Gardens in which we walked in the lush Landscape and passed by the Monastery where Pope Emeritus Benedict resides before arriving at the Vatican train station where we boarded and headed to the Apostolic Palace in Castel Gandolfo which is the Pope’s summer residence. Pope Francis opened it to the public in 2014 and we were able to tour the palace and its museum seeing St. John Paul II Pope Mobile along with many artifacts and paintings from Pope’s dating back centuries. When that tour was finished, Christian and I boarded a tour bus that took us throughout the Pontifical Villas which had statues and grottos dating back to Roman Emperors before it became possession of the Papacy. This was truly amazing to see where St. John Paul II would go to recharge after his travels abroad. The peace and serenity and the views were truly amazing. After the tour we had about 3 hours before the train headed back to the Vatican, so we went down the mountain and sat by the clear blue lake with Black Sand Beaches to relax and soak in the day’s blessings. 4. Feast of Josemaria Escriva Mass and visit to his tomb – The founder of Opus Dei has a special place for those of us who have been blessed to be part of The Rome Experience. Mass on Tuesday was a beautiful liturgy. With many bishops and dignitaries in attendance, the church was standing room only and with all the outside aisles 4-5 people deep against the walls. The following day we were able to visit the Opus Dei headquarters and receive a tour of the museum and pay our respects to St. Josemaria at his tomb under the altar of their chapel and to seek his intercession that we may grow in holiness as we pursue God’s Will! 5. Gelato Cup Run – On Wednesday this would have ranked #3 but was bumped down. 9 of the Seminarians including myself raced around Vatican City to see who would take home the Gelato Cup trophy filled with Old Bridge gelato. How many people can say that they ran around a sovereign nation? At least 9 more as we all finished without walking which is a feat considering the first mile seems like its straight uphill. Jacob Lindle was crowned the champion while Michael Willig, Deacon Francisco Onate-Vargas, Dale Alder, Edward Seeley, Luke Prihoda, James Beran, Ramon Reyes, and Brody Witt rounded out the rankings respectively. It was a great show of support by the entire group as everyone encouraged, clapped, hooted and hollared as we took off from the obelisk out and around the left arm of the colonnade towards the Vatican Museum and then again while we sprinted around the right arm of the Colonnade to the finish line back at the obelisk in the middle of St. Peter’s Square. My Metaphysics professor always told me about the transcendental quality of beauty and its ability to transcend the here and now and draw us closer to our Creator. Being in Europe the past month and having seen many beautiful works of art at the Prado, the Vatican Museum, the Sistine Chapel and every Major Basilica I truly understand his point. One fresco that captivated me was San Gioacchino (Joachim) in Prati in Rome. 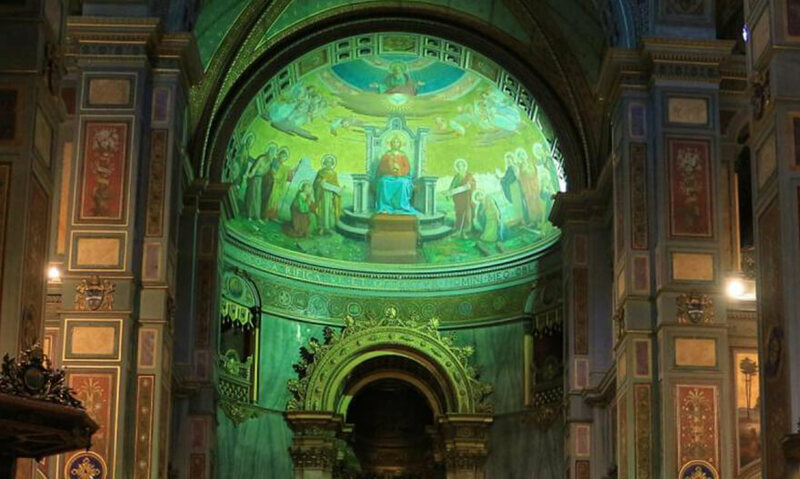 As I entered the church, I looked down the main aisle and was struck by the fresco in the apse. I decided to take it to meditation and allow the Lord to speak to me through this piece of art. I have attached a photo, but I want to describe what I saw in the painting. Jesus Christ is sitting on a throne holding a chalice and host with the Twelve surrounding him on each side. The break in the coloring of the green earth and gold heaven are the white cities of Jerusalem and Rome. You will notice the angels flanking the right and left of the throne in the golden heaven. In the top and in the center, you will see our Heavenly Father along with a dove representing the Holy Spirit between Christ and the Father. My initial thought is that Christ is enthroned as the Eternal High Priest with the apostles in adoration. The vertical line of sight between the Father, Son and Holy Spirit drew my mind to the necessity as a future priest of union with the Trinity. As one who would stand In-Persona Christi while lifting the Body and Blood of our Lord, I must remain centered with my eyes lifted to heaven seeking the Father’s will, led by the Way, the Truth, and the Light, and guided by the movement of the Holy Spirit. The strength drawn from our vertical relationship with the Trinity must not be only for my use but also for the good of my brothers and sisters in Christ. The horizontal view of those following Christ is just as important for a priest because he must also bring Christ to others. He must pass on the knowledge of the Father to those under his care so that they may be armed to go out to the world and proclaim the Good News just like the Twelve. After meditating on the fresco, I researched the painting on the parish website to learn that the scrolls in Peter and Paul’s hands read “Becoming a participant in the divine nature” and “I have received from the Lord what I have transmitted to you too…” This is so true that a priest calls down the divine to the altar through the Holy Spirit and allows those who partake in the offering to receive the fully human and fully divine Lord. This can only be done if we allow the Lord to utilize us as instruments in Salvation History; by transmitting his gifts through our talents and actions. For all those reading this post, I challenge you to sit with nature or a piece of art and allow the Holy Spirit to allow it to transcend the here and now so you may be drawn closer to our Creator for your good and the good of those around you.